Very vanilla cupcakes with maple whipped cream piped on top: 1 cup of heavy cream plus 1 to 2 tablespoons of maple syrup, whip with a mixer until the cream forms stiff peaks. Since one of us here doesn’t really like chocolate (can you imagine? ), and every so often someone asks me if I have a vanilla cupcake recipe. I decided to post this gluten-free, super-charged vanilla cupcake recipe using coconut flour. My older son needs to minimize his almond intake right now. This is a bit challenging for me considering I was doing a lot of baking with almond flour and I have a personal love for almonds. But it’s a good thing for us to rotate the foods we eat—that way we’re getting a variety of nutrients and fiber from different sources for a well-balanced diet. To get a very vanilla taste to these cupcakes, I use vanilla bean seeds. People do a lot of interesting things with vanilla beans. Besides steeping it in milk and cream when making vanilla ice cream, you can make your own vanilla extract, put it in your vacuum bag to freshen up your “environment”, or add it to baked and seasoned dishes, as I’ve done here with this vanilla cupcake recipe. I also added vanilla beans to the buttercream frosting on these cupcakes in the photo above. Vanilla beans are not cheap, so if you don’t have one lying around or don’t want to invest the extra $, no worries—these cupcakes will still make someone’s day! 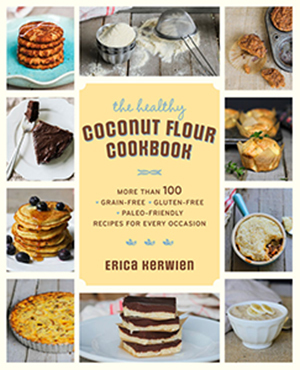 My original inspiration to give coconut flour a try for donuts & cupcakes, came from this post. And here’s a video on how to scrape the vanilla seeds from a vanilla bean. I use 2 tablespoons of coconut milk to this cupcake to make it a more tender tasty muffin. You can use any dairy or dairy-free milk. I recommend parchment cupcake liners or silicone muffin liners for all cupcakes made with coconut flour and I know some readers also grease the liners. Combine all the dry in ingredients, except for the vanilla seeds, and blend well. Add the wet ingredients to the dry ingredients and use a mixer to blend well. You can use a food processor, hand or standing mixer to get it well-blended. Let the batter sit for a few minutes and mix once more. Optionally, add the vanilla beans and blend well. The batter is thin. Bake for about 20 minutes or until a toothpick inserted in the center of a cupcake comes out clean. Store covered for a few days at room temperature, or the refrigerator for a few weeks, or freeze for a few months. Love vanilla cupcakes and missing them since turning Paleo…can’t wait to try this! thanks so much! Just put them in the oven! Yummy smelling! I have never used coconut flour but I have been meaning to- this recipe is spurring me to action. Off to the store I go! How did you know that I have coconut flour to make something with? 1st time trying it. I love the seeing the vanilla seeds in the frosting – almost like sprinkles. The chocolate cupcakes look good too. Hmm . . . which one to make 1st? Thanks for posting this. Oh gracious! I need these!! We have a ton of coconut flour and were always looking for ways to use it. This is a good thing to remember when we need to use it up! You are amazing! My son will be SOOO pleased. Thank you! I’m going to try your thin crust pizza too! Many thanks! These look great. We have a lot of August birthdays here. Your banana muffin recipe with chocolate chips and your flourless brownie recipe are staples in our house. so…what’s the verdict on coconut flour for a 1 yr. olds birthday? would it be too much fiber – any thoughts? Good question – which I don’t know the answer too. Sorry. Yum! Lots of people liked them here. It’s good I made a double batch! The texture is really good. I can’t wait to try the yellow cake. Thanks. I just got allergy results back and both almond and egg yolks are gone. I know I could sub 2 egg whites for per egg, but have you ever found anything else you could use instead of eggs? Would chia seed work? I love the lightness of coconut flour but don’t want to over use the egg whites. Ideas? I substituted 3/4 cups flaxseed mixture and 1/4 cup banana. It’s great! great site. thanks for the link and the info! Oh my gosh!!!!!!!!!!!!!!!!!!!!! These cupcakes are amazing!!!!!!!!! There are not enough exclamation points in the words. I made a chocolate mousse frosting with cocoa powder, heavy cream, 1 mashed banana, vanilla, maple syrup, soft butter and a tiny bit of coconut flour.My toddler and I just finished the last one and we are seriously thinking about making more. I found your website recently and I love your recipes. I would love to try replacing the honey with Truvia but I am scared to try it. I was wondering if I would need to add some liquid i.e more butter/ oil or another egg to replace the missing liquid of the honey. I would love any suggestions you might have. Thank you so much! I’m not familiar with Truvia, but yes, you do want to replace the liquid from the honey or maple syrup with something – my instinct says water would be good enough. Did you put vanilla bean in the icing? So glad to see new recipes for coconut flour. After 2 years on SCD I became really allergic to almond flour from over exposure and since then well I just don’t even cook anymore 🙁 I can’t wait to try these. no – the ratio of ingredients would be different here. Look for my fluffy cupcake recipe. I just made the vanilla and chocolate cupcakes of yours today! The flavor and textures are great! I was wondering if you or someone would happen to know what I am doing wrong. Both sets of my cupcakes are sunken-in in the middle…and I notice yours are nicely rounded on top. Could that mean I am mixing too much or not enough? I used butter and honey in both recipes…everything else was exactly as written. Our elevation is 3,000 — could that be affecting something? Thank you! hmm. I only have the sinking with the almond flour and honey combo in baked goods. I wonder if it’s the honey? Is it softer in the middle? that would indicate it’s not fully baked. Otherwise, maybe add less honey? I have coconut shreds. Can this be turned into coconut flour? It is organic unsweetened as well. Thanks! If you have a food processor or high-speed blender, I’d say yes. You want it really ground up – like almost powder. I added chocolate chips to these and melted chocolate on top, these also and they make wonderful chocolate chip cupcakes! Oooooh, these were gooood 🙂 I’m making another batch today because the first 8 disappeared! YUMMY! Thanks for sharing! Perfect! I added mini chocolate chips and baked a 9″ round cake for my 3-yr’s birthday. He loved it, brother and sister loved it, and my husband said, “What cake is this? It’s delicious! !” — probably the only gluten free cake he’s ever had, and my first to bake from scratch. I’m the only one eating “mostly-paleo” on purpose and I will totally use this recipe again! Very nice cake, worked at high altitude (5000ft), and great to have a non-chocolate option. I bet it would be good with raspberries stirred in. Oh and the cake took 20 min in the oven. Two years later this is still one of my favorite recipes. I recently added blueberries and baked it as a coffee cake for church volunteers. I got 4 recipe requests! Good to hear! 🙂 You would love my blueberry coffee cake in my SCD book! I made these and added the zest & juice of one clementine to the batter instead of the vanilla beans — they were SO good!! Thanks for the awesome recipe!!! i just made these and they just came out of the oven. i haven’t tried them but they smell amazing and licking the mixer paddle proved that they are going to taste great. however, every time i bake with coconut flour, my batter thickens up and becomes “scoopable”, read more cookie dough. Is that how your batter looks? As a result, I don’t get a smooth surface on the top of the cupcake. It’s just a cosmetic thing but I’m just curious. Just had this happen too. I think it’s from trying to get the lumps of flour out. Wondering if I had sifted the flour if it wouldn’t have been as lumpy…. Sifting might help, but it’s mostly the nature of coconut flour. Mixing it for a while is what I’ve found works the best. Yes, they are more “scoopable”, in general. Once trick I’ve found is if you leave the batter in the mixer and let the mixer “mix” for a while (I have an old Kitchen Aid mixer that keeps going) the batter does get thinner. So I recommend mixing for a while with coconut flour. Also let it sit for a bit to absorb the moisture. It sounds like something is missing from the batter. Maybe baking soda? Or enough eggs? I got everything in there. Not sure what happened. Will have to just try again! 🙂 I did just come across your ‘baking with coconut flour’ post and saw the mixing instructions there. They taste fine, just no the right texture! Hi! Do you have a suggestion to use instead of honey for a sweetener? Would stevia work? I haven’t used Stevia, but do a search on Stevia on the site. Others have used it along with glycerin for the added moisture that honey has. I sub maple syrup with honey, and some have used sugar-free maple syrup. I baked these yesterday. They are absolutely amazing! Your SCD recipes are the best. Thank you sooo much. These turned out great. I was thinking about using the same recipe, but change vanilla extract for almond extract. I just baked these and they are divine! Thank you so much. I googled coconut flour cupcake and got directed to your site. I am definitely getting your site on my reader! Thanks a million. Do you use non-stick cooking spray on the the cupcake liners? Do you think this will taste as yummy if I freeze them for a few days before a birthday party then thaw and frost the day of the birthday party? I would guess they would be ok, but not as good as when freshly made. Made these using brown sugar instead of honey, and lard and coconut oil for the fat. Baked for 10 minutes in a muffin top pan. They taste like cake donuts!! yes, or vegetable oil, or butter. I am vegan and I have egg replacers (the powder form you mix with water) and can I usees this in place of eggs? I haven’t tried it, but it should work if it is meant to act as a binder. I made these for my Daughter’s fourth birthday knowing they would be eaten by non~ gluten free, non grain free family. They passed the test with everyone. They were better than any gluten white cake cupcakes I have ever eaten. I have used coconut flour many times and seem to haveixed success with it but this was the best coconut flour recipe I have tried. I’m also getting a cookie dough type texture. This is not a ‘batter’ by any means….have to roll it off the spoon to get it in the liner. I used 1/2 honey, 1/2 syrup and liquified coconut oil….and even tried adding a tad bit of water to see if it would thin, but it didn’t. I’m afraid they’re going to be more like a muffin….we’ll see. Batters come in all shapes and sizes :). Yes, this can be more of a “scoopable” batter, but keep the faith. As long as you followed the directions it should be fine. BTW, the recipe calls for 1/2 cup of honey OR syrup. Can I use a bundt cake pan? I am not sure if the consistency will change. Wow! I just made this and it tastes amazing! Definitely for vanilla-lovers like myself! I didn’t have a muffin pan so I baked it for 30 minutes in a 7″ round cake pan and they came out perfect! Moist with a soft and crumbly texture. I did reduce the amount of honey to 1/3 cup as I prefer only lightly sweetened cakes. I also added some chopped macadamia nuts and dried cranberries because I happen to have some on hand. I’m definitely making this again probably adding other dried fruit or nuts or even spices. I can’t thank you enough for sharing this wonderful recipe! you’re welcome! Yes, I sometimes add less honey as well. It actually bakes well with a bit less honey. Cheers! I just made these and they are fantastic! Thank you so much for the recipe! We’re new to gluten free, and baking is hard work, but these are a hit! Yum! I would say almost any oil but a finishing oil would work here. One with the least flavor would be good so it doesn’t over power the vanilla flavoring – my personal choice would be sunflower oil, coconut oil, or ghee. hmm…these aren’t awful. Mine came out a bit dry and more muffin-like than cake-like. And they definitely need frosting because they don’t come out particularly pretty 😛 I had very high hopes, as I’m trying these grain-free recipes for my son’s first birthday (we don’t feed him any grains). The only substitute I made was using liquid stevia and unsweetened applesauce in place of the honey/syrup since I’m a type 2 diabetic. Yeah, I think this recipe really needs the full moisture of the liquid sweetener. Subbing in other ingredients is not always ideal. I’m new to gluten free baking and this is my first recipe using coconut flour. These are the best cupcakes I’ve ever had!! They came out perfectly! Very moist and light with a wonderful coconut flavor. I also made the vanilla buttercream frosting (with maple syrup) and it is a perfect topping for the cupcakes. Actually, these cupcakes are so great they don’t even need frosting! Thank you for posting such yummy, simple, easy to make recipes! I’m looking forward to baking many more of your recipes! Hello – I made these tonight, but I can’t figure out what it is I’m doing wrong. They came out TERRIBLY. They looked fine when I pulled them out of the oven, but when I went to remove them from the cupcake pan, i noticed that anything that was not directly exposed to the heat looked like a gelatinous mess. Upon further inspection, they were deflated and EXTREMELY oily and jiggly. When I picked one up, oil literally oozed from it into my hand. I followed the recipe and directions to a t. Now it’s just a lot of good ingredients wasted because these are too disgusting to eat. Any ideas what happened? not sure, but did you follow the recipe, or sub any ingredients? Can you use regular liquid vanilla extract instead of the beans? Yes, or leave it out. This was my first time baking with coconut flour …. They taste amazing! My 2year old is going to love eating one for tomorrow’s snack ! If I was going to use this recipe to make a cake what size pan would you recommend? This recipe makes one layer of a cake, so I’d use an 8 or 9-inch round pan. Our family is now getting away from modified food starches of any kind. All the recipes I have looked at on your blog here have been starch free. Thank you!! We baked these cupcakes tonight and LOVE them!! I made this cake for Christmas yesterday. I used butter and 4 tbsp full fat coconut milk. It was delicious and moist. The only thing that I found is that it didn’t rise. I’m going to play with the baking soda to see if I can’t get a more cake like rise to it. Huge hit and I can’t wait to share with my readers! you may want to test your baking soda to make sure it’s still active. To do this, put a few tablespoons of white vinegar into a small bowl and add a teaspoon of baking soda. It should bubble and the foaming should take several moments to subside. The more bubbles, the more potent the baking soda. If there is no reaction, or you only end up with a handful of small bubbles, you need to replace you baking soda. I’ve never had a problem with these, they turn out great. I am going to bake these today. Refined and GMO foods, especially high fructose corn syrup, have ruined my son’s stomach over the past 10 years and we are using coconut parts all the time. Just for anyone who may be interested, I tripled this recipe today and made a 9 inch 2 layer cake and it turned out beautifully. So if you’d like to make a cake instead of cupcakes, it works very well! Thank you! Thank you! Thank you! I was craving something cupcake-y and came across this site. I started making these and then found out I was out of vanilla (ugh – of course I would run out of vanilla). I ended up using mostly almond extract with a little lemon extract – and the cupcakes still turned out amazing. Just made these…so delicious!… So healthy and tasty! !… Sweet but not too sweet! I had to cook mine for 25 mins and they were very brown on the outside but the inside was perfectly moist! Made cream cheese icing on top using coconut sugar! The two pairings worked very well together! Or almond butter to use as a breakfast muffin. Loving these alternative recipes for baking!! Thanks, Jordan. I’ve never had these turn dark, but glad they worked out. These cupcakes are amazing!!! Moist and fluffy but not eggy! I have a hard time finding coconut flour recipes that have a good texture… Will make again!!! What would happen if more milk was added to this receipe? I really want to make an earl-grey cupcake (like this: http://www.bhg.com/blogs/delish-dish/2014/05/06/lavender-earl-grey-cupcakes/), but want to use coconut flour. Thank you!! Excited to try this! I’ve haven’t tried this, but, I think you can let tea sit in the milk for quite a while to infuse it naturally. Another option would be to simmer the coconut milk and earl gray tea for a while until it’s reduced to 2 tablespoons. Let me know if you try it! Thanks for you reply! Hmm, simmering it could be a good idea…. My cupcake are slightly too moist inside. How can I make the cupcake less moist? This is a great recipe! Thank you. I have made them several times. One was even a wedding cake! Love the tip on letting the mixture sit for a few. I feel it makes a big difference. there must be a misprint. 1/2 c coconut flour is not enough. it looks like soup. Yes, the batter is thin. It will bake well. celebrated my granddaughter’s fourth birthday on the weekend and this recipe was a hit!…we searched long and hard for celebratory food choices using non-inflammatory, quality ingredients that would appeal to kids and adults alike…i used half honey/half maple syrup…didn’t have a bean but will definitely try that option next time…and there will be many ‘next times’..in fact, before i packed up and drove back home from my son’s house, i baked up another triple batch per his request! What’s the nutrition facts on these? They were fantastic btw! Thanks! Yes, this is a very reliable recipe. I don’t list nutrition info, but it’s easy to find using internet or phone apps. What icing recipe is in the photo? It’s whipped cream. You can find various frostings/icings on my site – use the search at the top. I poured this into a 9 inch cake pan, but it’s not as thick as I’d like. Would making a double batch and splitting between two pans work okay? Maybe just bake them longer (I had to do 25 minutes for the one I made)? Also, this came out VERY sweet. Not sure if some honey is sweeter than others, but 1/2 cup was definitely too much. It overpowered any vanilla taste. Would I need to add more milk to it if I reduced the honey amount? I really want to find a cake recipe that tastes good for my son’s bday party on Sunday. I was hoping this would have worked, but I think it’s too sweet to serve. Yes, I think you can reduce the honey and add more milk. Do you use almond and coconut flour together? My favorite birthday cake is the one in my SCD book which uses both flours. I have made these cupcakes and kids love them. But just found out my kid has a egg allergy. Is there a way to make these using some kind of egg replacement? Thanks! It will be tricky. I recommend flaxseed meal to replace the eggs, but not for all 4 eggs. To use no more than 2 flaxseed eggs, cut the recipe in half. I haven’t tried this specifically with this recipe, but in general I’ve found no more than 2 flaxseed eggs in baked goods. I have made these cupcakes many times and kids love them. But just found out my kid has a egg allergy. Is there a way to make these using some kind of egg replacement? Thanks! Thank you Erica. My child is mainly allergic to the egg whites so would it would using just the egg yolks? I don’t know if using just the yolks would work. The white contains protein that bonds the ingredients. Can you use chia or flaxseed meal? The cake was very eggy, and tasted like baked eggs. I was really looking forward to this recipe and I was almost positive that it was gonna work, now all I have are wasted ingredients. I would check your measurements, and confirm you are using coconut flour. This is a well-tested recipe. To replace with a low-carb sweetener, it would depend on the recommended conversion, so use what the manufacturer calls for to make a 1:1 substitution for sugar and then add the equivalent measurement in liquid to make up for the loss in liquid from honey or maple syrup. So, for this recipe, you’ll use the amount of low-carb sweetener to convert to 1/2 cup of sugar and then add 1/2 cup of liquid as well (water, milk, or dairy-free milk). Would I have to double the recipe for a square pan? It depends on the size of the pan. For an 8×8 inch square probably not. But for a larger sheet pan cake, such as 9×11 inches, I would double it.